This review originally ran in the Tuesday, June 5 issue of Shelf Awareness for Readers. If you don't already subscribe, sign up here to receive a bi-weekly dose of readerly goodness in your inbox. London changed after Jack the Ripper's murders; the unsolved killings left behind a city terrified of its own shadow and with little to no respect for the police force. The gruesome killings also fueled the creation of "The Murder Squad"--a team of 12 detectives at Scotland Yard assigned to investigate only homicides. But the stakes are raised when the victim in one of their cases turns out to be one of their own, and the freshman squad of detectives must reckon with a new kind of killer--one who acts not out of passion or motive, but out of a compulsive need to kill. Welcome to the age of the serial killer. 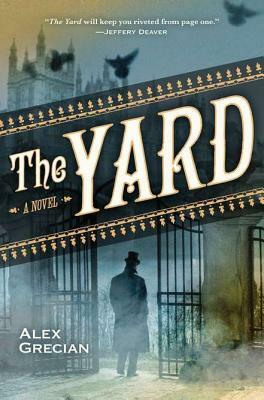 The Yard, Alex Grecian's debut novel, draws on true historical situations as the backdrop for the story of the murdered detective. The Murder Squad was a real entity, founded in 1889 to combat the rise of crime in London and to help redeem the police in the eyes of the public after the failure to identify Jack the Ripper. Into this world, Grecian introduces Inspector Walter Day, the newest member of the Murder Squad, assigned to the case of the murdered squad member. But The Yard doesn't stop there; Grecian weaves together multiple cases, reflecting with historical accuracy the overworked nature of the Murder Squad, the interrelated nature of their cases and the advent of forensic science in aiding investigations. Packed with period detail, The Yard is both a well-crafted mystery and careful study of an important era of criminology, making for one captivating read. I've had my eye on the audio version. This sort of story just pulls me right in and I admit that I was initially pulled in by the covert art! I featured this in my new release picks one week and have been planning to read it ever since. I am glad to see that you liked it. I can't wait to make the time for it myself. I'm glad you liked this too! I felt it was a little slow to get going, but once all the pistons were firing it raced along until the end. It's a good summer read for sure.